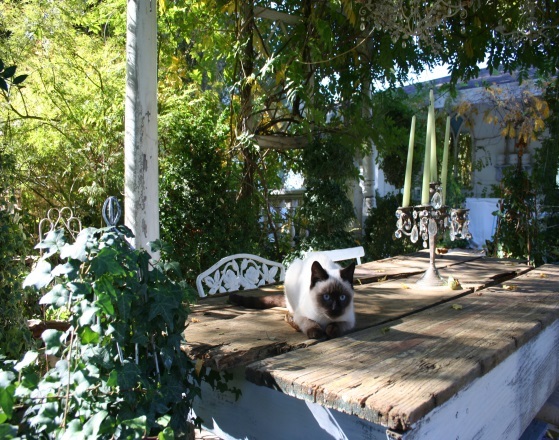 I find myself intrigued by the Shabby Chic garden. It can vary so much in style. 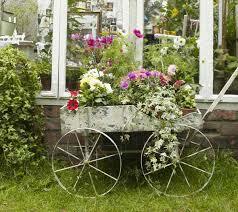 It often blends the appeal of vintage art or antiques…even furniture within your plant palette of choice. 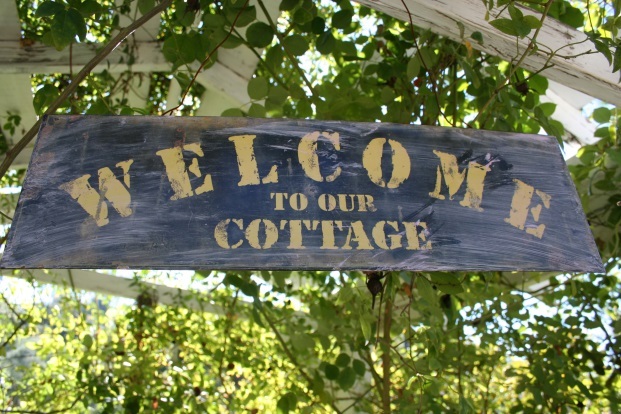 I’ve seen it presented with Roses and Perennials leaning toward a Cottage Garden appearance, but it can be achieved in formal or rural settings, as well. The uniqueness seems to be inspired by the creator of the garden, just as a painting is inspired by the artist. I once had the pleasure of meeting a family, living in the foothills of the Sierras with a home on property in a peaceful mountain setting. They loved going to flea markets, and as schedules allowed, traveled miles to attend their favorites. The whole family anticipated the adventure, bringing treasures home to be beautifully repurposed. On my visit to their home, I felt as though I’d stepped into an enchanted paradise. It was simple, rustic, and yet romantic and very inviting. You just never knew what to expect around the next corner. Beautiful linens and lace mingled with natural, wood shelves. Chandeliers and French doors combined with ivy crawling outside and in through cracks and crevices. Old wood made into garden signs with lavender paint led me down paths to a table decorated with a sleeping cat next to a Victorian candle holder with a candle I’m sure they lit when they gathered at the outdoor table, but could picture the lushness of spring with leaves and blossoms covering the easy open canopy above the table. I was simply captivated. 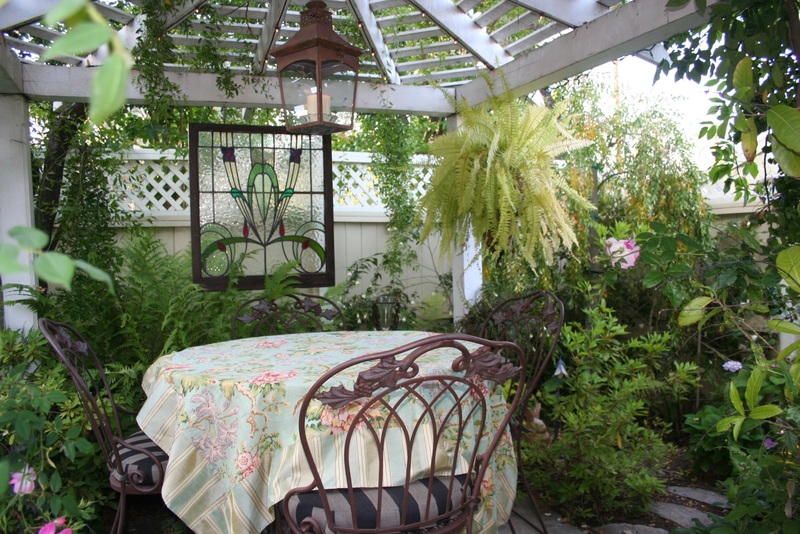 A wide sweeping lawn held an inviting rustic swing covered in fluffy pillows of beautiful faded fabric, and a simple table for four was covered with a white table cloth set with crystal and china shaded by huge evergreen trees. They had collected and pieced together a wonderland of comfort, so inviting I didn’t want to leave. From stained glass windows, to old restored cupboards filled with delightful odd & ends, and the added touch of signs and trays of painted roses, it combined together in an elegant simplicity. I believe if it had to be defined, could only be called a Shabby Chic home at its best, both inside and out. 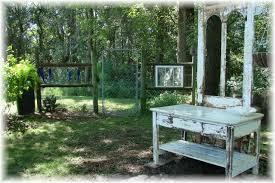 This spring, my newest project is to transform my side yard into a “Shabby Chic” garden! I’m so excited to hunt for my treasures. 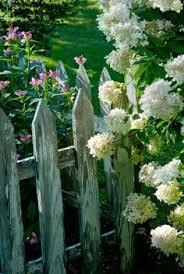 I’m planning on finding a pair of old shutters or trellises to detract from the chain link fence. I have a metal arbor at the front entrance covered with a climbing vine, and I’ve planted my bird bath with succulents. 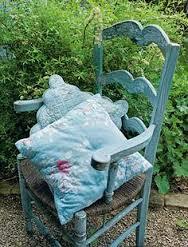 I hope to add an old chair with a playful planted seat… and from there I hope the setting will tell me what comes next. I’m excited about transforming my garden, they can be so much fun as they grow and change with us. Just as we never stay the same, we can carry our new interests into venues for creativity. 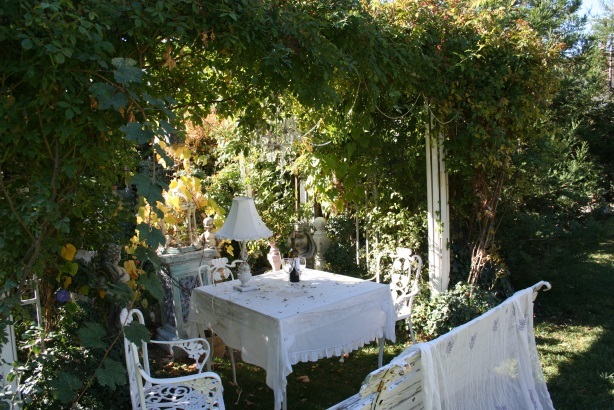 The Shabby Chic garden has room for romance, candle holders, china and chairs. It gives expression to your soul and a place to share with friends. It is a pallet for blending comfort and elegance, but is best done in simplicity, or it may seem cluttered, defeating its purpose. Simplicity spells peace. It can be as simple as a picket fence with old-fashions roses…or wicker chairs with fluffy pillows in a corner of the garden or porch. It can be a chandelier hanging from your gazebo, a wheel barrow brimming with flowers…or a bird house on a tall, ivy covered pole. The ideas will come from your heart to reflect in your garden.